The Mexican holiday of Cinco de Mayo (5 May) commemorates the Battle of Puebla, fought on May 5, 1862. Puebla is a major city about 100km east of Mexico City, on the historically important route to the port of Veracruz. In 2012, to mark the 150th Anniversary of the Battle of Puebla, a major re-enactment of the Battle was held in Puebla, attended by the President and many cabinet members and officials. A commemorative bi-metallic 10-peso coin was also issued to commemorate this anniversary. 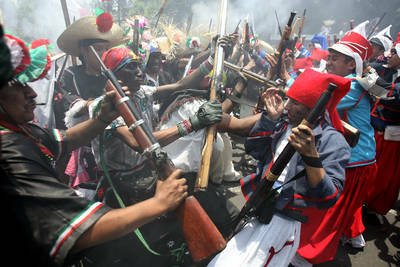 Since the 1930s, a re-enactment of the Battle of Puebla has been held each year at Peñón de los Baños, a rocky outcrop close to Mexico City’s international airport. Of geographical and geological interest, the rocky outcrop of Peñón de los Baños was formerly an island in the middle of Lake Texcoco. The prominent landmark was visited by Alexander von Humboldt when he toured parts of Mexico in 1803-4. Among other things, Humboldt analyzed the chemical composition of its thermal springs, thought to have curative and medicinal properties. The re-enactment of the Battle of Puebla at Peñón de los Baños attracts tourists, history buffs, and Mexico City residents looking for an unusual experience. Celebrations of 5 May in the USA date back to the third quarter of the nineteenth century (only a few years after the Battle in 1862), though they gained prominence only after the 1950s and 60s when major Mexican beer makers associated their brands with Cinco de Mayo celebrations north of the border. Mexican beer may be one of the country’s most important exports but, as the annual re-enactment in Peñón de los Baños shows, the commemorations of Cinco de Mayo still held on Mexican soil are far more authentic.